China’s military conducted the first flight test of a new long-range intercontinental ballistic missile (ICBM) that U.S. officials say will be Beijing’s first strategic missile armed with multiple warheads. The flight test of the DF-41 road-mobile ICBM occurred July 24 and is raising new concerns within the U.S. military and intelligence agencies over China’s long-range missile threat, according to officials familiar with reports of the test. The DF-41 missile is a first-strike nuclear capability, based on its mobility, estimated range, targeting precision, and multiple warheads. In addition to shorter-range ICBMs known as the DF-31 and DF-31A, which are believed to target India and Russia, the new ICBM is said by U.S. officials to be designed to hit U.S. targets with multiple nuclear warheads. China has claimed it will not be the first to use nuclear weapons and that its nuclear forces are designed for a counterstrike against a nuclear attack on its territory. The DF-41 development has called into question the so-called no-first-use policy, officials said. The test is also likely to renew debate within U.S. intelligence circles about whether China is seeking only a limited nuclear force, or is secretly building up its nuclear forces to challenge U.S. strategic power. The new missile bolsters China’s strategic forces, making them among the most diverse in the world, with a variety of short-, medium-, intermediate-, and intercontinental-range missiles. China also has developed ground-launched anti-satellite missiles and a unique anti-ship ballistic missile with enough accuracy to hit U.S. aircraft carriers at sea. It is also believed that the DF-41 is part of efforts by China to develop missiles that can defeat U.S. strategic missile defenses. The Pentagon currently has a limited system capable of stopping a few North Korean ICBMs. 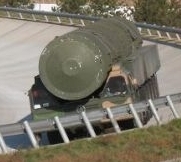 Former military intelligence official Larry Wortzel, a member of the congressional U.S.-China Economic and Security Review Commission, said the DF-41's multiple warheads are expected to include special simulated warheads called "penetration aids" that are designed counter U.S. missile defense sensors. The DF-41 "is mobile and will be very hard to detect and counter because of that mobility," Wortzel said. "The warhead array will most certainly include penetration aids." A Pentagon spokeswoman declined to comment on the missile test. Details of the flight test could not be learned. However, past China flight tests of long-range missiles involved launches from the Wuzhai Space and Missile Test Center that flew west into the far western Chinese desert several thousand miles away. Analysts say such flight tests are often shortened by limiting the time the first stage fires in order to keep the missile within Chinese territory. "There are credible references to a DF-41 program in the Chinese literature," said Mark Stokes, a former Pentagon official and specialist on China’s strategic nuclear systems. "The system appears to incorporate a new, larger solid rocket motor than that used on the DF-31 series of delivery vehicles. Ground tests on the motor have been underway for a couple of years." Stokes, executive director of the Project 2049 Institute, said the Chinese military’s Second Artillery Corps, which is in charge of both strategic and non-nuclear missiles, is working to integrate the DF-41 into its operational inventory. "Tentative indications exist that the Second Artillery force has established an operational test and evaluation unit in southern Henan Province," he said. Stokes said it is not clear whether the current DF-41 program is similar to an earlier program in the 1990s that was believed to have been converted into the less-capable DF-31A missile, "but it looks real." U.S. intelligence analysts suspect the DF-41 is based on Russia’s long-range mobile missile known as the SS-27 and that Russian missile guidance technology—either purchased or stolen by Chinese spies—is part of the system. Phillip Karber, a Georgetown University professor who has studied Chinese nuclear programs, said the DF-41 test could signal a major boost in estimates of China’s strategic nuclear forces. Karber said it is likely the DF-41 will carry three warheads, and if the Chinese follow Russia’s model of building three re-load missiles for each launcher, the number of Chinese strategic warheads could more than double from current levels. A future DF-41 force of some 32 missiles with reloads and multiple warheads would be enough for China to target every U.S. city with a population over 50,000 people, Karber said. "If the Chinese end up developing that kind of counter-value posture against American cities, and we do not build missile defenses against it, it spells the end of extended nuclear deterrence for Asia," Karber said. The result would be a likely nuclear arms race in Asia. Richard Fisher, a specialist on the Chinese military affairs, said the DF-41 has been under development since 1986, but the U.S. government is only now recognizing it. "Pentagon reticence to disclose information about this missile is further confused by the fact that Chinese Internet source images of the 18-wheel Transporter-Erector-Launcher (TEL) for this missile have been available since 2007," said Fisher, a senior fellow at the International Assessment and Strategy Center. "There are now four distinct images of this TEL that show it is a very large mobile ICBM, similar in size to modern Russian mobile ICBMs." Fisher said the DF-41 test is probably the missile referenced briefly in the Pentagon’s 2011 annual report on the Chinese military but omitted from this year’s abbreviated report to Congress. In addition to the DF-31 and DF-31A, "China may also be developing a new road-mobile ICBM, possibly capable of carrying a multiple independently targetable re-entry vehicle (MIRV)," the Pentagon report said. 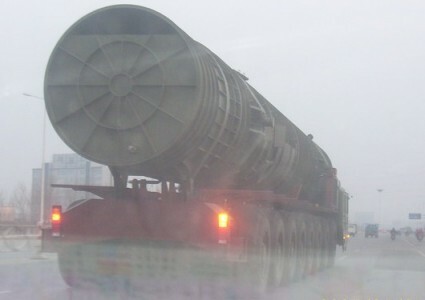 The website missilethreat.com reported that the DF-41 can be armed with up to 10 MIRV warheads. 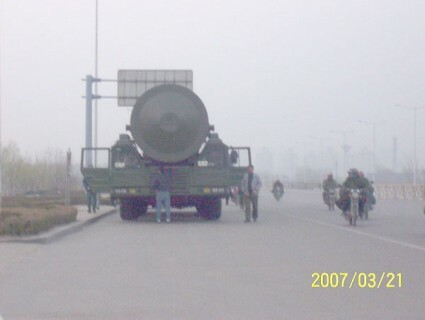 The DF-41 "is easily capable of striking the United States and will likely become the core of the PRC’s nuclear strike force," Missilethreat.com stated in its assessment. Its maximum range is estimated to be 8,699 miles, enough to reach targets throughout the United States from mobile launchers in eastern or northern China. China, to date, has not been known to place multiple warheads on its missiles, but obtained technology from the United States in the 1990s for launching multiple satellites on a launcher that U.S. officials say provides a base for MIRV warheads. China also obtained through espionage details of the U.S. W-88 small nuclear warhead in the 1990s, according to U.S. intelligence assessments. The W-88 is used on U.S. submarine-launched ballistic missiles and is considered suitable for multiple-warhead missiles. China’s total nuclear warhead force is unknown. U.S. intelligence agencies estimate there are between 300 and 400 warheads in the Chinese arsenal. However, the actual number could be far higher, based on recent disclosures that China has built 3,000 miles of underground tunnels and nuclear facilities throughout the country. Fisher said he was told by a foreign military source in 2010 that the new long-range mobile missile could carry as many as 10 warheads, which means U.S. estimates of Chinese warhead stockpiles may be low. "So if you assume that a PLA Second Artillery contains 18 ICBM size missiles, that could mean an increase of 180 warheads per deployed brigade," Fisher said. "Judging from the PLA production rate for the DF-31A ICBM, it appears they could easily produce up to one new brigade per year. So if we assume that testing transitions to continuous production and deployment by 2015, then it is plausible that the DF-41 alone could account for up to 900 warheads by 2020." China’s warhead force for long-range missiles could be has high as 1,032, based on the number of submarines and mobile missile brigades China is deploying, Fisher said. "These are plausible estimates; they may or may not happen, [but] the point is that we don’t know for sure, and the PLA has made crystal clear that it does not want to talk to the U.S. government about its current or future nuclear missile capabilities," Fisher said. In addition to China’s refusal to hold strategic nuclear talks, Beijing also may be engaged in a "massive deception" that Fisher says is highlighted by the 3,000 miles of underground nuclear tunnels to support nuclear and military forces. The flight test of the DF-41 also undermined the analysis of some specialists who have sought to play down China’s nuclear ambitions. For example, the Federation of American Scientists reported in 2008 that the DF-41 program was canceled. The trade publication Jane’s Strategic Weapons Systems reported in February that the DF-41 would replace China’s older, silo-based strategic missiles, known as the DF-5 and DF-5A. "The development for DF-41 is believed to be managed by the China Aerospace Sciences and Industry Corporation (CASIC), Beijing," Jane’s stated in its report. "The flight test program is managed by the Second Artillery Corps, based at the Wuzhai test center in Shanxi province. There was one reported ground test and a simulated cold launch in October 1999, but no test flights have been reported." 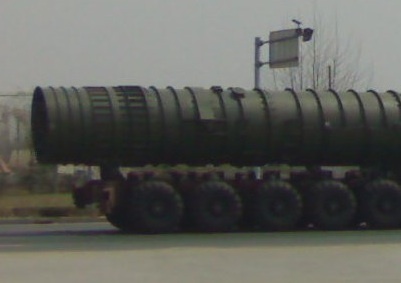 Initially, the DF-41 was described as a missile built from the first two stages of the DF-31 with a lengthened third stage. "But it is now believed that this description referred to the DF-31A, and that the DF-41 is a new design," Jane’s stated, noting that both road mobile launchers and railroad car launchers could be used. This entry was posted in National Security and tagged China, Defense, Missile Defense, Nuclear Weapons. Bookmark the permalink.